Joey Harker is a Leader. 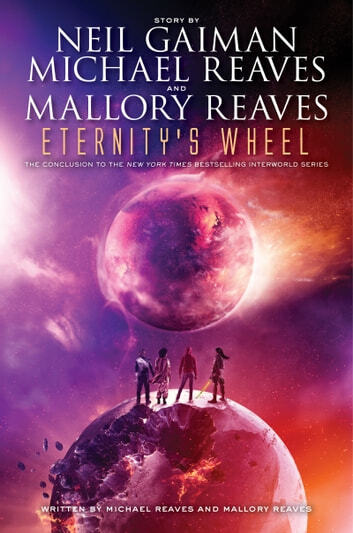 With InterWorld trapped by HEX and his only other companion—the mysterious Time Agent Acacia Jones—missing in action, Joey's the only one left. Though injured and alone, he refuses to give up. How can he, when all the worlds are depending on him? As the threat of FrostNight looms ever closer, Joey seeks out more of his fellow Walkers across the Altiverse, training them as fast as he can and trying to track down InterWorld Base Town along the way. But even a solid team of recruits—including Acacia's brother, Avery, who's not a recruit so much as a tenuous ally—can't prepare Joey for the ultimate showdown with InterWorld's enemies, old and new. Joey never wanted to be in charge. But he's the one everyone is looking to now, and he'll have to step up if he has any hope of saving InterWorld, the Multiverse, and everything in between. Eternity's Wheel is the heart-pounding conclusion to the InterWorld series, full of time and space travel, magic, science, and the bravery of a young boy who must now face his destiny as a young man.